We love getting tips on new books! This tip on a book came from what one of our own Revolution Greens crew members. 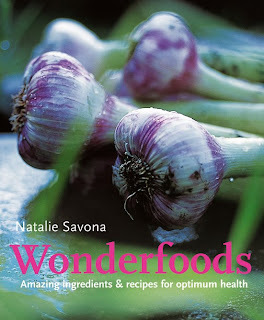 The book is Wonderfoods by Natalie Savona. This inspiring book shows how food can be used in specific ways to boost energy, improve skin, build up immune systems, increase sexual pleasure or relax after a difficult day. The book describes 70 Wonderfoods and ingredients containing the dynamic nutrients that contribute to wellbeing. Wonderfoods also contains over 120 simple but tasty recipes drawn from a range of international culinary styles, and advice on where to buy and source the best ingredients. Pick up the book and eat your way to healthier life! Cheers!